Feel free to use. Our small club used this method for informal weekly indoor winter shoots. I came up with it so shooters of all skill levels could compete together. When you have only 12 reqular shooters, from marksmen to master, this helps level the playing field. Everyone has a chance to win. If there is no goal to advance too and its just luck of the draw who wins where is the since of accomplishment? 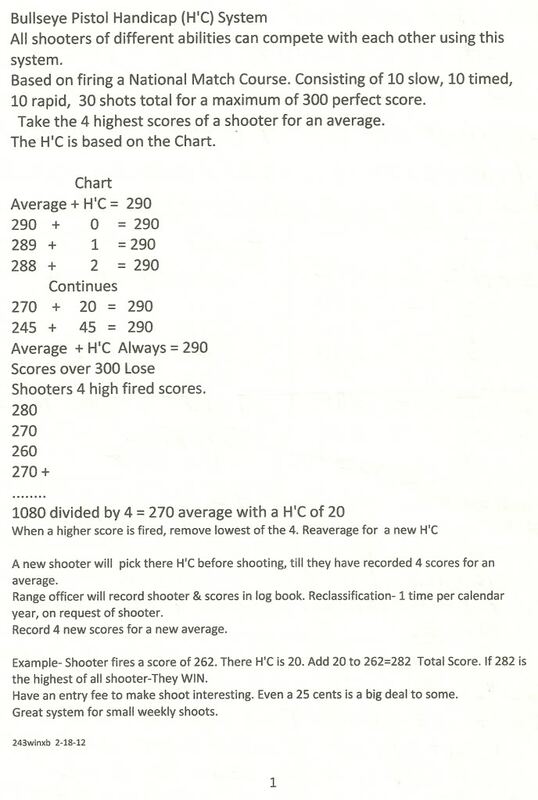 Our league uses average monthly scores to class shooters. This gives everyone a equal chance at a prize and the shooters have a goal to shoot for, advancing to the next class as their skill level goes up same as the NRA. we have 3 classes and each class is awarded a gift certificate from the range for1st and second place when they have shot at least 3 weeks of a 4 week month. We average 12-20 shooters weekly. Each week our guys try to best their buddies in their class and have a great time doing it. A new shooter that keeps improving a little each week is rewarded by winning. This keeps them interested and they will return each week. With 5 different NRA clasifications in Bullseye and 12 shooters, there may not be 2 people in the same class. This system puts everyone on a level playing field. More fun and keeps the High Masters on there toes. It may not be for every one, but it works, if given a chance. Has anyone tried this. It does work well for small weekly club shoots. Thank you. It is no different than using a handicap in golf. There will always be some who think a handicap is an unfair but what it does do is it makes you always try to do your personal best. I would be very open to shooting under a handicap system if something was close enough for me to compete in. 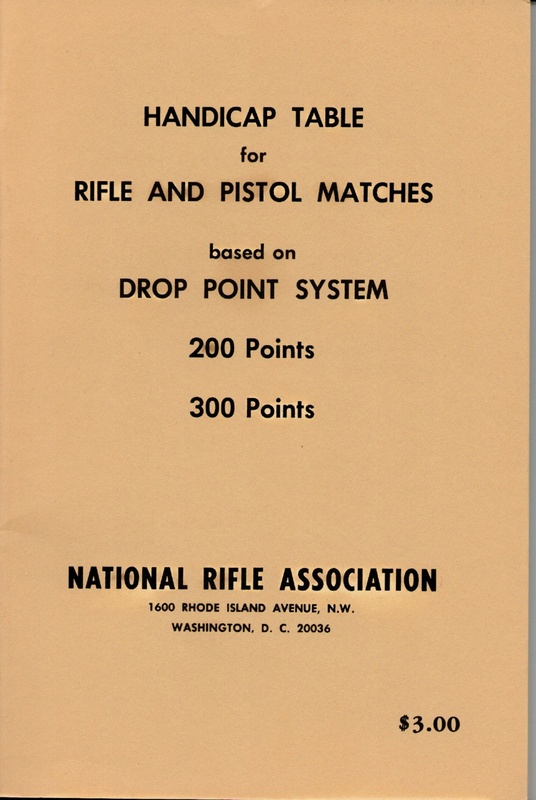 NRA has an actual handicap book for smallbore rifle based on a 300 point match, could easily be transferred to a 300 point pistol match. Seeing as it should be easy to have databases and spreadsheets calculate standings and placements in a dozen different ways, I see no reason not to post club results in any way people can think of. Have a very dim understanding of how to calculate handicaps from bowling. Looked it up and the formula could easily be used in Precision shooting. Be prepared for endless bickering over the determination of BS and %. We use this for our weekly league matches. 1600 Rhode Island Ave. That is an oldie. Wobbley wrote: 1600 Rhode Island Ave. That is an oldie. Just got a new copy a couple years ago. They never changed the front of the book. They must have a ton of them in storage. CDRT, Is the information available online? Slartybartfast wrote: CDRT, Is the information available online? Not that I know of. This is the link to buy copies of the Handicap Table book from the NRA. 243winxb wrote: Feel free to use. Our small club used this method for informal weekly indoor winter shoots. Over 300 loses is harsh. All it seems to do IMO is have good shooters setup to see all shots and add up their score as they shoot. Once it's over 290, stop shooting or shoot for ones. Real pity for the participant who's a very low average with a high handicap and has one superb performance. In bowling, the maximum score for any one bowler is simply 300. And the top individual and team scratch score of every night is announced. I don't see why the same wouldn't be used in pistol. Max 300, ties by X count. In reality, with a handicap average set adequately and a percentage of less than 100% the chances of anyone beating 300 should be once-in-a-lifetime astronomically thin requiring a personal best score. DavidR wrote: If there is no goal to advance too and its just luck of the draw who wins where is the since of accomplishment? I can tell you there's is nothing luck of the draw in my for fun bowling league. If I don't match my friend's performance I can't even tie him. I need to do better than average and he needs at least a slip up or two for me to get the win. When I pull ahead of him in a game, I know he's having an awful game and I'm doing alright, or that I'm doing really well. And if by miracle I'm beating him on scratch score, I know he's ill or I'm on fire. What we're comparing is PERFORMANCE. And every week I get close to him or beat him, the following weeks I need to keep improving performance to just tie. And while the handicap scores make everyone relate-able, at the end of things the scratch score puts anyone back in their place if they're overly jubilant. So what sense of accomplishment is lost? I had little sense of accomplishment being the best of the lowest ranking rifle shooters at the rifle club for the longest time and then spending weeks/months at the bottom of the next higher ranking wasn't confidence building. And shooting up the ranks to plateau shooting pistol gave me neither excitement for the fast rise, nor inspire confidence once I plateaued. In bowling, besides the sense of competition created, when I'm within striking distance of a lead the best bowlers take notice and I get congratulations about things done well and encouragement and suggestions where I'm failing. Interesting. Didnt know about the NRA Handicap Table book. Thank you. https://issuu.com/compshoot/docs/2010nraslh NRA has 4 methods, starting on page 17. Now i need to read it. The " Dropped Point System" looks useful. It rewards improvements. Some form of handicap system would seem to get more young shooters interested? Best at local levels? I was brainstorming a little on what league and club awards and recognition could be given to highlight and encourage improvement. Thought of more ways, but my statistics knowledge isn't up to par to describe my thoughts. But there undoubtedly ways to quantify rate of change, consistency, etc. Honestly, the monthly averages at my last club didn't seem to encourage many. And my biggest pet peeve about the annual competition is that you could keep shooting and submitting better scores until the end of the competition period. In my mind the difference between practice and competition is the pressure of good or bad the scores will count. I handle the stats for a regional Bullseye League that includes 4 shooting teams ranging from a high of 25 shooters to 8 shooters per team. We shoot 4 travel matches at the beginning of the season and 4 travel matches at the end of the season with 7 matches in the middle shot "postal" (at our own range). You have to do this if you live in Wisconsin and shoot from September through April. Traveling is not always recommended! The travel matches are the toughest to shoot. I have used several scoring methods since 2004 when I began recording the stats. From a home made sliding scale, bowling method, and now back to a more "pure" NRA drop point handicap system. The issue has always been determining a fair and equitable average for each shooter. Let's call the shooter average his/her "ability level", that is the level the shooter can achieve when they are at or near their best. I determine this by averaging the highest three scores from the last 8 matches shot. Other averaging methods have been tried, but they all fail the "manipulation" test. That is, they suffer from not being shot under match conditions and thereby are not representative. This is the reason the NRA tables provide wide swings in handicap scores week to week for many shooters. 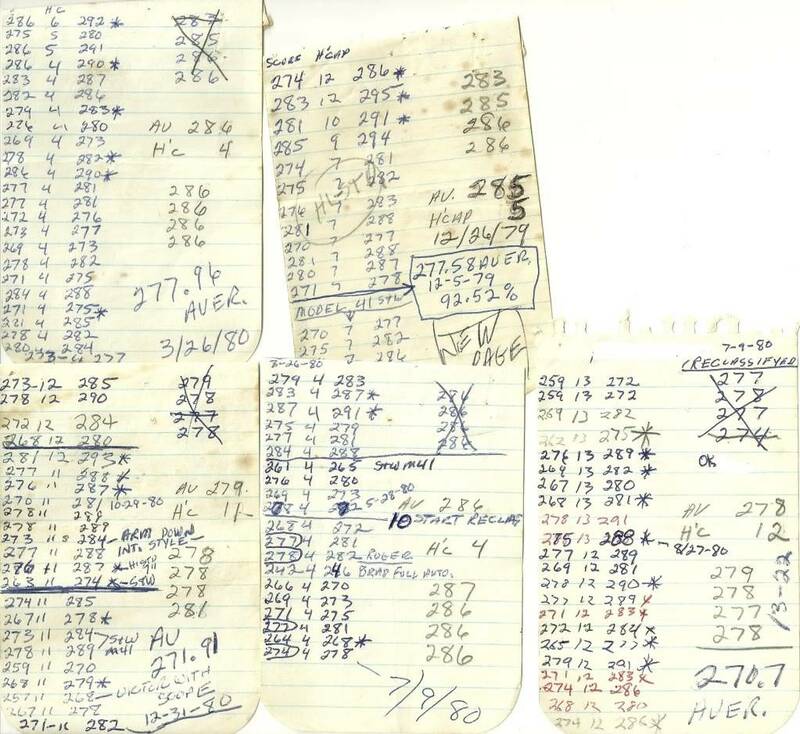 The table on the last page of the NRA drop point system book provides a list of percentages that can be used in Excel sheets as a lookup for a shooter handicap factor. In any case, if a shooter shoots the earned ability level average, his score will be within a point or two of 285. Only if a shooter exceeds that ability level will he/she be able to score over 285. The higher the drop points (300-score), the greater the advantage the shooter has to earn a high handicap score giving lower level shooters a greater advantage. The drop point value is multiplied by the NRA factor for the shooters average and then added to the shooters current score. No scores will ever be over 300! The other modification is that the "ability level" changes throughout the season by always averaging the highest 3 scores. It is a sliding window starting with the highest scores from the last 8 matches (from previous season) and moving forward every match always recalculation the top 3 average. This stabilizes the use of he NRA table and gives each shooter a goal to shoot for every match. The last modification we use is to add the top 5 handicap scores from each team for each gun and assign team points based on placement. The teams with the highest accumulated scores at the end of the season receive trophies and bragging rights. I can provide sample Excel sheets if anyone is interested. I'll take a sample set, thanks. Thx, Would you please send the sample set.